As President Trump‘s State Department took steps to approve the Keystone XL pipeline, the project’s owner, TransCanada, lobbied on two bills in Montana which will ease the company’s regulatory burden in the state. Those bills, HB 365 and SB 109, moved along in the state’s legislature with no media coverage despite the state being the first crossed in the pipeline’s proposed journey from Alberta, Canada to Steele City, Nebraska. HB 365, which passed in May, will allow TransCanada to escape civil liability for any potential damages suffered by its contracted land surveyors. Meanwhile, SB 109 would have required environmental reviews for infrastructure projects in Montana to consider impacts beyond state lines, but failed to pass. TransCanada spent $4,348 on its Montana lobbying efforts for the 2017 session, according to its post-session disclosure form, including $830 wining and dining the 10-member Montana American Indian Caucus. The slated 830,000 barrel-per-day oil pipeline would pass near the Fort Peck Indian Reservation and cross the Missouri River, a water source for 7,000 Assiniboine and Sioux tribe members. Members of the Montana American Indian Caucus and TransCanada lobbyist Ken Morrison did not respond to a request for comment for this story. Keystone XL has come under fierce opposition by Montana’s Native American Tribes, who have signed resolutions in opposition to Keystone XL. The original Keystone pipeline, which carries tar sands oil through North Dakota, South Dakota, and Nebraska, has spilled over a dozen times. Its most recent incident occurred in 2016 when 16,800 gallons spilled in South Dakota. Keystone XL would also cross the Yellowstone River, a tributary of the Missouri River which also saw two pipelines spill over 100,000 gallons of oil into its waters since 2011. HB 365 appears to offer civil lawsuit immunity to companies like TransCanada when its contractors lay pipelines and utility lines under the ground, instead passing potential tort lawsuit liability to them. Under tort law, civil courts allow plaintiffs to sue corporations and individuals for damages committed against them. “An underground facility owner is not liable for any damages suffered by the registered land surveyor or any person under the control of the registered land surveyor,” reads the bill’s key language, which amends Montana state code 69-4-502. HB 365 was sponsored by Republican state Rep. Ray Shaw. Though a company representative did not testify on behalf of the bill, TransCanada’s lobbyist Ken Morrison attended the hearing for the bill and registered in support of it on a sign-in sheet. In juxtaposition, SB 109 was short-lived and did not make it out of committee after being sponsored and introduced by Democratic Rep. Mike Phillips. The bill would have changed the Montana Environmental Policy Act, expanding review of a project’s environmental impacts beyond state borders. Specifically, it called for “the integrated use of the natural and social sciences and the environmental design arts in planning and in decisionmaking for a state-sponsored project that may have an impact on the human environment,” here substituting “human” for “Montana” in the existing law and broadening beyond state borders the environment which could be considered impacted in the bill at-large. Keystone XL would join the broader Keystone Pipeline System, crossing many other states in its sojourn to Port Arthur, Texas and the Houston Ship Channel. President Barack Obama‘s State Department completed a federal environmental impact statement, pointing to multiple potential environmental and climate impacts from the Alberta tar sands oil which would flow through the pipeline. But under the current version of the Montana Environmental Policy Act, only potential environmental impacts of projects like Keystone XL that occur inside state boundaries can be considered during environmental reviews. While TransCanada did not attend the hearing for SB 109, it did lobby against the bill, according to lobbying disclosure records. Those lobbying for the bill included a representative from the environmental group Audubon Montana. During its 2017 session, the Montana Legislature also passed Senate Joint Resolution 10, which called for Keystone XL‘s approval. The bill, also lobbied for by TransCanada and sponsored by Republican Rep. Mike Lang, bears the same language as one passed by the legislature in 2015 and similar language to an American Legislative Exchange Council (ALEC) model resolution. As DeSmog reported, TransCanada has also recently upped the ante on its federal lobbying efforts, hiring a lobbyist who had served as head legal counsel of the U.S. House Committee on Natural Resources. Montana’s Democratic Governor Steve Bullock, who signed into law both HB 365 and Senate Joint Resolution 10, has taken over $36,000 from the oil and gas industry throughout his political career. Despite all the lobbying efforts, however, it remains unclear whether the pipeline will ever open for business. On one hand, environmental groups have brought a federal lawsuit against the Trump administration, alleging its Keystone XL permitting process violates the National Environmental Policy Act. On the other hand, TransCanada itself is unsure whether market demand still exists for the pipeline. 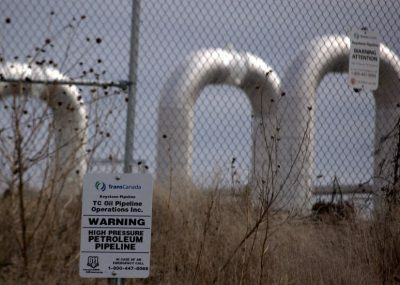 By the year’s end, TransCanada expects to make a final decision on whether to proceed with Keystone XL.